The Paracer, or Paraceratherium (pair-uh-sair-oth-EE-re-um) is one of the creatures in ARK: Survival Evolved. Paraceratherium gigamicus is a massive, long-necked herbivore that inhabits some of the Island's grasslands. It resembles a gigantic horse/rhinoceros hybrid, but is over twice the size of either. Paraceratherium is a very peaceful and friendly creature. Barring some surprises yet in store for me, I can safely say that Paraceratherium is among the largest mammals on the Island. While its size means that Paraceratherium can provide an incredible amount of food, it also makes it dangerous when hunted. A beast of burden second to the Brontosaurus, Paraceratherium is an excellent worker, and is sufficient in size to support a "platform" saddle upon which structures can be built. It is a naturally friendly animal, and is not afraid of humans. However, despite its normally calm demeanor, when it or its owner is provoked by aggression, the Paraceratherium can quickly become a real threat to the attacker and will use its girth to its advantage in combat. Paraceratherium, due to a lack of natural enemies because of its sheer size, is naturally docile. It will ignore humans and other creatures so long as not provoked. Once it is attacked, the animal quickly becomes dangerous. Again, because of its size and immense weight, the Paracer is an extremely deadly adversary so proceed with caution. Luckily, Paracer are solitary creatures living alone or in small family groups. They will protect their fellow herd members if necessary. Don't be fooled by its large size and seemingly docile temperament,the Paracer is an incredibly fast and strong creature when it wants to be. With high health and quick movement, this quick horse-like creature can be slow to take down, and can dish out devastating attacks to survivors and smaller Dino's. Because of their need for copious amounts of nourishment and physical size, Paracer tend to roam the edge of forests and valleys in the lower altitudes. Avoiding dense forests if possible. Paraceratherium is a large terrestrial mammal estimated to weigh between 15-20 tons (33,000 to 44,000 lbs) when fully grown. Standing approximately 16 feet at the withers and 24 feet in length. Paracer's build is rather stocky with long, robust legs to support the animal's immense size. A long thick neck, upwards of 4–5 feet long, allows the animal to easily graze high vegetation. Paracer's hide is extremely thick and hairless. Excess skin folds onto itself similar to modern day Rhinos. Hide color ranges from brown to grey. Small eyes and ears allow limited vision/hearing that is overcompensated by an excellent sense of smell. This section displays the Paraceratherium's natural colors and regions. 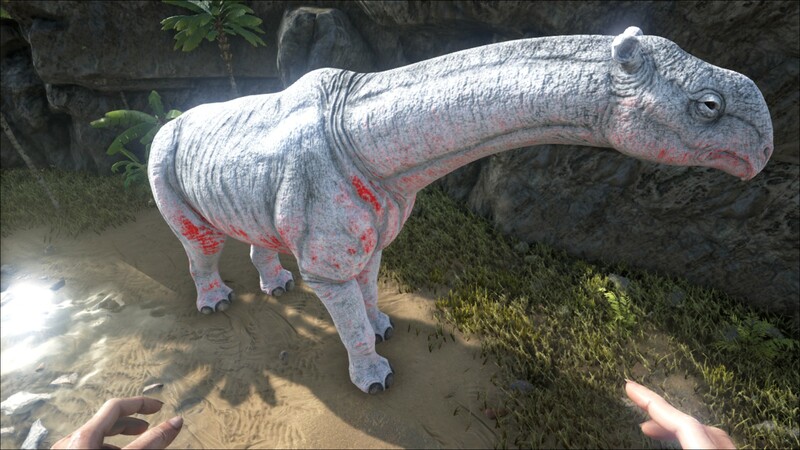 For demonstration, the regions below are colored red over an albino Paraceratherium. The colored squares shown underneath each region's description are the colors that the Paraceratherium will randomly spawn with to provide an overall range of its natural color scheme. Hover your cursor over a color to display its name and ID. 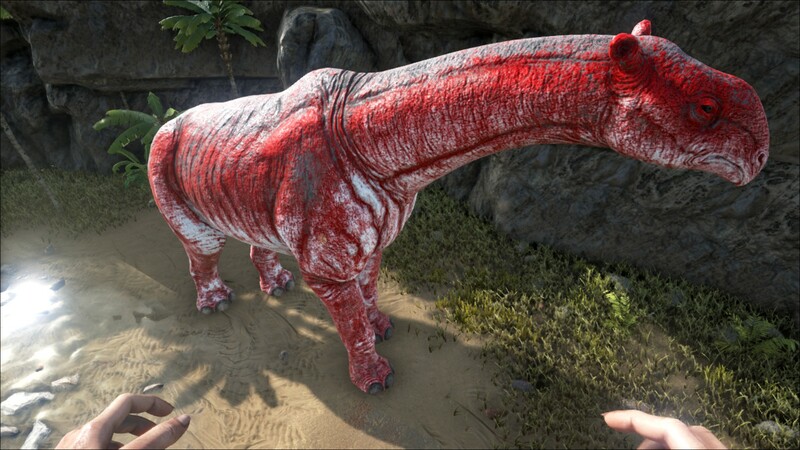 For example, "cheat SetTargetDinoColor 0 6" would color the Paraceratherium's "body" magenta. A rather standard tame, use the crossbow with tranq arrows leaving a few seconds between each shot. It tends to have pretty high torpor and can move fast for an animal of its size, either kite it around or have a friend hover you above with a flyer and aim for the head for a quicker KO. They can also be Snagged on bigger Destructible rocks, and shot at from the other side, as they are not quite as capable of maneuvering over them, but are tall enough to hit the head or neck. This section describes how to fight against the Paraceratherium. 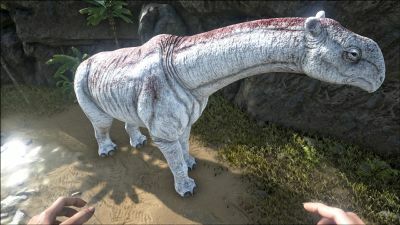 The Paracer is one of the largest herbivores and has slightly more health than a Rex and high damage. They tend to spawn in groups of 2 or more. Despite the Paracer's strength, it is slower than a player and its large size means it can be stuck behind boulders, but it will destroy any trees blocking its path. It can also be kited to a cliff where you can shoot it safely. When using a reasonably fast mount attacking its back feet is a good way to kill it fast and take minimal damage in the process. A decent ranged weapon such as a crossbow or a Longneck Rifle is effective at killing the Paracer before it can reach you. A decent dino can kill a single Paracer without problems, but a group can deal a large amount of damage quickly to the dino. The Paracer usually spawns in small groups and can overwhelm an unprepared target. Its attacks have a wide range and even when escaping its stomp attack can be powerful to small creatures such as Raptors. Its large size means it can get stuck easily, and it will run away once it has taken sufficient damage, giving a large window to attack. Also, unlike other creatures, the AoE of this creature also hits wild creatures, making them attack depending on their temperament. You can utilize this to kill huge groups of Paracers. Then, quickly harvest the corpse. Mobile base: Although you can't build a base as big as the one you can build on a Brontosaurus, Paracer is ideal for survivors that want to have a small hut with the basic structures in it. On Scorched Earth and Aberration, they are the only creature that can support a platform saddle (Level Health, Speed, and Stamina; also level Weight if used for transport). Transportation: An ideal beast of burden, the Paracer could carry a fair amount of goods. It has a quick pace (compared to the Brontosaurus), and can easily be carried by a large elevator platform under full load, can effectively navigate on open Tree Platforms, and is ignored by most smaller predators and has a decent AOE damage and HP against larger ones (Level Speed, Stamina, and Weight). Battle Platform: As a beast of war the Paracer is often overlooked in favor of the Bronto. However, it does have a number of qualities that work in its favor: compared to the Bronto the Paracer requires much less food in order to tame, is quicker, and the platform saddle is available at a much lower level. This can allow an aspiring tribe to mount mobile Ballista Turrets to help combat larger creatures or protect its tribe-members behind walls to allow them to get to a battle safely (Level Health, Melee Damage, Speed, and Stamina when necessary). Prime Meat Jerky: Having a Paracer with an Industrial Grill on the platform saddle can make getting Cooked Prime for Jerky very easy. Not only can it follow you at quick pace and make sure the prime doesn't spoil, it can help you with killing the source of the prime meat (Level Health, Melee Damage, and Weight when needed). Paraceratherium is the largest terrestrial mammal to ever live. Paraceratherium is a close relative of modern-day Rhinoceroses. Paraceratherium comes from the Greek words pará - near, keras - horn and thēríon - beast, which refers to the relationship to Rhinoceros. Paraceratherium is also known as Indricotherium or Baluchitherium. Paraceratherium appears to drop much more Raw Prime Meat than even Brontosaurus. Consider hunting them when in need of Prime Raw Meat for taming or cooking. Paraceratherium Requires a Behemoth gate due to its height, but is able to easily walk through a gap two walls wide. They can occasionally walk over a wall that is two units high, and can step over a one-high wall without slowing down at all. The Paracer is one of only a few creatures to not be included in a Spotlight video (excluding the initial creatures).